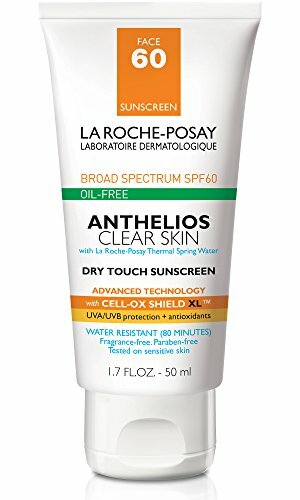 La Roche-Posay Anthelios Clear Skin, Dry Touch Face Sunscreen, Oil Free with SPF 60, 1.7 Fl. Oz. Perlite & Silica, a unique oil-absorbing complex, helps absorb excess oil, oil-free, dry touch texture. A pioneer in UV protection research for over 15 years, La Roche-Posay, with Anthelios, is trusted by dermatologists worldwide for its advanced formulations in UV protection. If wearing with makeup, apply sunscreen first, followed by makeup. Product packaging may vary.